The Rebel Sweetheart. : Foodie Goodie | Red Velvet White Chocolate Chip Cookies. 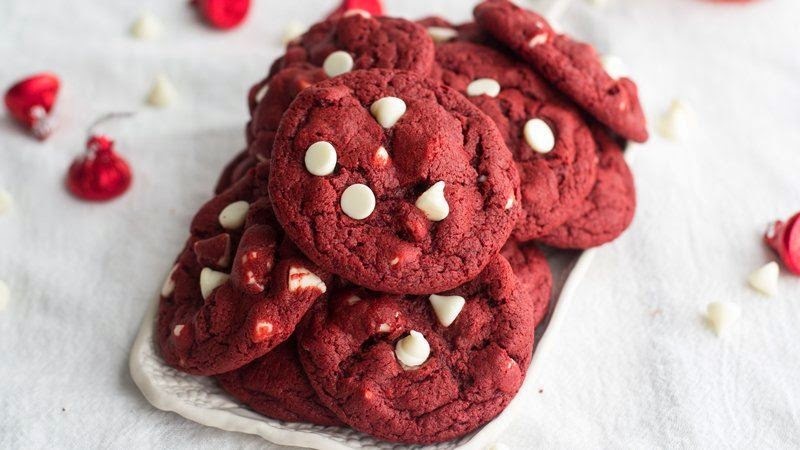 Foodie Goodie | Red Velvet White Chocolate Chip Cookies. Cooking for your loved ones on Valentine's Day? How about adding this quick and easy red velvet dessert to your menu? 1. Heat oven to 350°F. Line 2 cookie sheets with silicone baking mats or cooking parchment paper. 2. In a large bowl, beat butter and brown sugar with electric mixer on medium speed until light and fluffy. 3. Beat in vanilla, egg and food color. 4. Add Bisquick mix and baking cocoa; beat on low speed until combined. 6. Drop dough by rounded tablespoonfuls about 2 inches apart on cookie sheets. 8. Cool on cookie sheets for 5 minutes. 9. Remove from cookie sheets to cooling racks. I love red velvet and I love cookies, but it never crossed my mind to the put two of them together. It looks so delicious, it makes me wonder why I didn't think of it first! These sound delicious. Perfect for Valentine's Day! Those cookies are perfect for Valentine's Day! I love how easy the recipe is too. Those look amazing! Red velvet plus chocolate plus cookies = YUM! Anyway, hope you had a nice Vday and CNY sis! Yummy, these look delicious. Red velvet is one of my favorites. I haven't tried using cake mix in cookies.